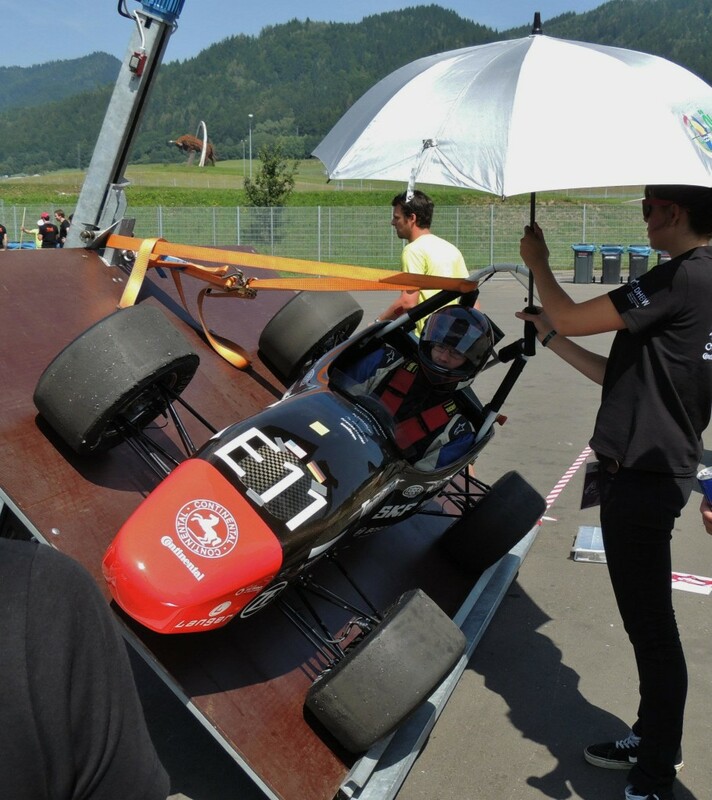 GFR’s combustion car claimed its fourth consecutive win at Formula Student Austria Friday July 20th, a record for most consecutive wins at an event in the Formula Student series. Austria was also the debut competition for Global Formula Racing’s electric car. The competition was held in Spielberg, Austria at the Red Bull Ring. Tuesday July 17th marked the start of the European competitions for Global Formula Racing. This year the team was going up against 42 teams from all over the world. On the first day of competition the teams were woken up by the sound of fighter jets overhead. The sound of the engines got everyone excited to start FSA. 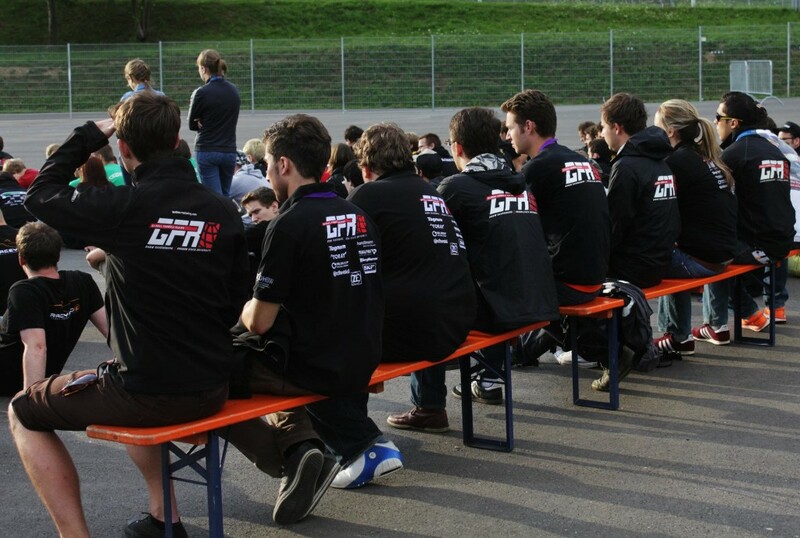 In typical Formula Student fashion, the first day consisted only of tech inspection. The cCar was the first one in line to get checked out and right behind it was the eCar. There were almost no problems until the eCar started to have trouble with its Tractive-System-Active-Ligtht. The light would go off when the high voltage system wasn’t turned on. This stopped the eCar from finishing tech until the next day. The combustion car finished the technical inspection with little difficulty claiming its first sticker from FSA. The following day both the cCar and the eCar had very busy mornings. They started their day off with Design Presentation. This is where the team had to defend design concept of the car and had to show the judges their overall knowledge of the car and engineering concepts. Here the cCar claimed 9th place and received 90 points of 150. 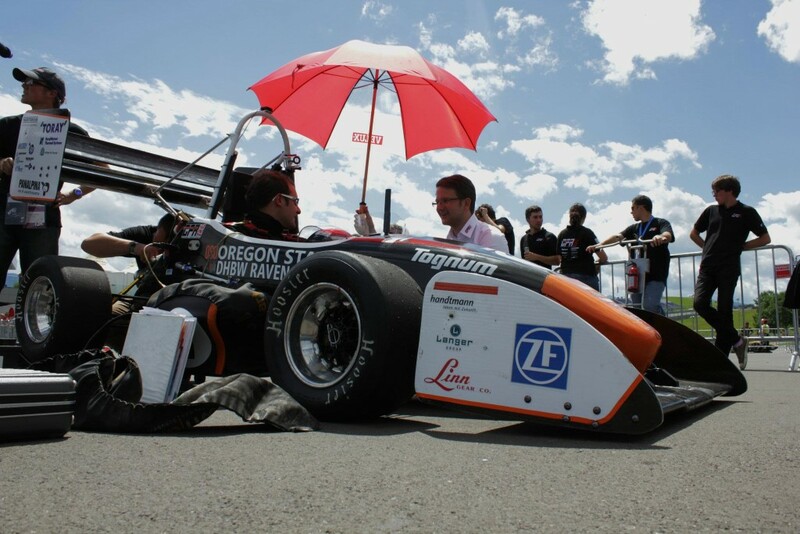 The electric car on the other hand was one of the top four design finalists along with Joanneum Racing, AMZ Racing Team, and TU Fast Racing Team. Design finals would take place the following day. Right after the team finished with design they pulled both cars over to the cost report event. This event required two people from both cars to give a detailed Bill of Materials of the car and also . Both cCar and eCar made it into the top ten with ecar taking 8th place and getting 68.1 points and cCar getting 3rd with 73.2 points out of 100. Following cost report was the business presentation event. For this event the team had to create a business plan to sell to potential investors in a 10 minute time period. Once again both cars made the top ten. The electric car came in 5th place with 68.8 points and the cCar came in 2nd with 73.4 points. The team finished all static events before noon leaving the rest of the day to focus on getting the car through tile, brake, and noise inspections in order to participate in the dynamic events. The electric car team continued fixing the problems they were having the day before. Thursday was the day that everyone had been waiting for, the start of the dynamic events. In the morning was acceleration and skid pad and in the afternoon was autocross. GFR12c had Doug Peterman and Lewis Raine, both new drivers to the team. Doug was the first one out on the course and put up a time of 5.425 seconds just .249 seconds behind the leader GreenTeam Uni Stuttgart. With this time, the ccar took 5th place and 58.6 points. Next in the car was Lewis. He hit the track setting an impressive acceleration time of 4.537 seconds which was .598 seconds behind the leader AMZ racing team. With only twenty minutes to spare the electric car finished with the safety inspection process and were able to participate in the first two dynamic events. With only 20 minutes they had time for only one acceleration run and one skid pad run. The driver, Sebastian Kleppe, put the car to the test and the first acceleration time he set was the second fastest time. Despite the quick time, the car had problems with braking causing it to come off course, earning a large time plenty. Sebastian was able to recover and finish skid pad with a time of 6.183 seconds. After a short lunch break the track was setup and ready to go for autocross. Global Formula Racing waited till the sun was high and the track was warm. The team had Matthias Woelfl and Phil Arscott go out to set their best autocross times. Both drivers had a chance to drive the course twice. Matthias was able to set a 2nd place of 59.948 seconds. Just .2 seconds off the leader of the AMZ Racing Team. As the ecar was getting ready to run autocross the team noticed there was a fault in the high voltage wiring stopping them from running the car, ultimately taking the electric car out of autocross. Coming into the final day of Formula Student Austria, the Global Formula Racing combustion car was in an unofficial 4th place overall behind AMZ, Rennstall, and Tufast with a 60 point gap from the leader. It was up to the endurance drivers Matthias and Phil to bring the team back up to first place. The eCar after having problems with the car throughout week was going into endurance in 12th. Since they weren’t able to complete autocross the eCar was the first one out on the track. Ryan Thoma was the first driver for the GFR12e endurance. Despite being a new driver and having a wet track, Ryan performed well. After finishing 12 laps he pulled into the pits for a driver change with Pasacal Basanow. He went out and claimed the fastest lap for the morning. On Pasacal’s last lap the BMS failed killing the car, he was still able to coast the car across the finish line and get 21st in endurance. Due to problems, the judges were unable to check the energy efficiency for the car. As the rest of the teams completed their endurance run, the cCar waited quietly for its turn. Matthias was the first to go out. Everyone was trying to catch Team Bath Racing, with the current fastest lap of 53.661. Matthias was able to get close, claiming the second fastest lap of the day, but not quite enough to take the win. At the end of 12 laps, Matthias came in for a driver change, remarked by the announcers as “the fastest driver change of the day”. Phil took the wheel and with every lap got faster and faster. Finally coming to his last few laps, he was able to put up the best lap of 52.354. Their times, including only 3 cones over 24 laps, earned the combustion car 1st in endurance. For fuel econemy the car was placed 8th, and was the most efficient combustion car. After 4 longs days and very competitive teams, GFR waited for the results to be announced. Global Formula Racing was unoffically 60 points behind the leader, AMZ, before endurance and hoped that taking first in Endurance would be enough to win. Sure enough Global Formula Racing took first place again for the 4th year in a row with AMZ in second and TUfast in third. GFR and AMZ were only 16 points apart making it one of the hardest years for the team. 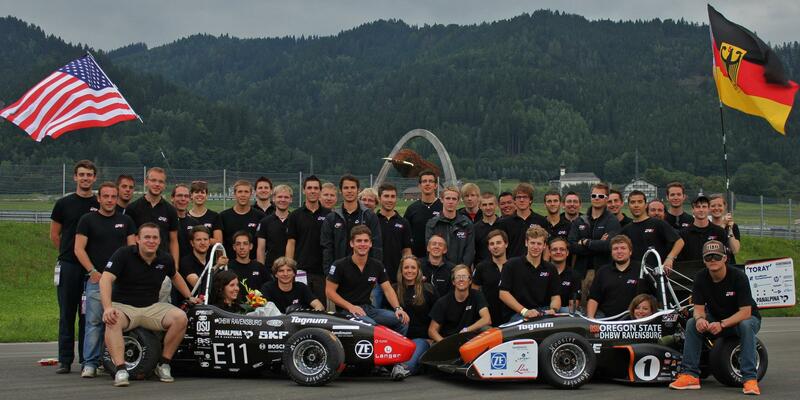 Hopefully Global Formula Racing can continue to show their skill as engineers in Formula Student Germany.